For holiday shoppers, Thanksgiving means more than just turkey. It kicks off the season's crowd fighting, bargain-hunting, big bucks shopping extravaganza. Unfortunately, many consumers shop their way right into a lot of holiday debt. Early Show Financial Advisor Ray Martin offers tips for keeping your gift buying under control. According to the 2002 American Express Retail Index (a big survey of shoppers the financial company conducts every November), the average holiday budget is up about five percent this year. On average, Americans plan to spend $1,656 on holiday gifts, entertaining, decorations and travel. The largest part of that budget will go toward gifts - about $1,073 - and $238 will cover entertainment costs. And yes, women will spend about $100 more than men on gifts! While shoppers may be spending more than last year, half of them will be on the lookout for "practical" gifts, AMEX reported. Another change already underway is an increase in "early-bird shoppers." The ranks of those who have already checked some names off shopping lists has doubled; 11 percent said they already made holiday purchases. Martin applauds these folks, and encourages everyone to start their shopping sooner rather than later. "Last minute shoppers pay the price for their procrastination in several ways," he says. "They don't have the time to look for sales, be selective or price compare. Taking the time to do this can save as much as 20 percent on some purchases. Also, late shoppers tend to use premium delivery services such as next-day delivery as opposed to two to three-day delivery." Here's another positive change as reported by AMEX: 65 percent of people are setting holiday budgets this year, up from last year. However, as we all know, good intentions are one thing, actually sticking to a budget is another. The International Mass Retail Association said that last year, consumers spent 31 percent more than they had intended. On average, consumers go over their budgets by 15 to 30 percent. Deciding how much to spend is, of course, a personal decision. Martin's general rule of thumb: make sure that you can pay off all purchases and debt before April 1. If it takes you longer than three months, you're in over your head and paying too much in interest charges. When setting a budget, Martin recommends making a list of everyone you want to buy a gift for and how much you want to spend. With budget in hand, you'll be less likely to impulse buy and overspend. Next, decide how much of your total budget you'll put on credit cards and how many gifts you'll buy with cash. This step is often overlooked, but it's important. 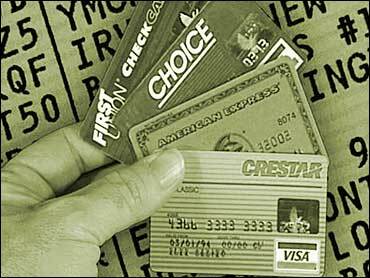 Many credit cards don't have a grace period for purchases. That means, if you already have a balance on your card, new purchases immediately begin to accumulate interest. (If you don't have a balance, you have 30 days to pay the bill before interest begins to accumulate on a purchase.) So, that $300 digital camera you bought for Dad could wind up costing $336 if you charge it on a card carrying a balance at a 12 percent interest rate. The majority of shoppers this year say they'll use cash to buy most or all of their holiday gifts. More people will be using credit cards and fewer will be using paper checks. "It appears those funny VISA check card ads are finally taking their toll on "good old-fashioned" paper checks," Martin says. He says more people should be buying gifts with credit cards. He even goes so far as to say that consumers should consider buying ALL of their gifts with credit cards. Why? Protect Yourself: If you lose cash in the midst of shopping madness, it's gone forever. If someone swipes your debit card, they can use it and money immediately disappears from your account. Paper checks carry your name and address, leaving you vulnerable to identity theft. Credit cards are your safest way to make purchases. Earn Rewards: Many cards offer airline miles or cash back when you use them. Receive Consumer Benefits: Credit cards offer protection against no-return policies, replacement of stolen or damaged items, guarantee of lowest price and extension of manufacturers warranty. Take Advantage Of Discounts: If you sign up for a retailer's credit card (Gap, Bannana Republic, etc) you can receive 20 percent of your purchases that day. Again, if you're going to use a credit card, be prepared to pay off your debt within three months!!! Also, when using a credit card, Martin recommends carrying just one card. "Spreading purchases on several cards makes it easier to overspend and rack up more debt," he explains. "If you must carry a balance, apply for a card that offers the lowest interest rates." Some of the lowest-rate cards available can be found on bankrate.com. Martin's final holiday shopping tip: save those receipts! "No matter how well planned your shopping is, it's inevitable that some gifts will need to be returned or exchanged," he says. "Save your receipts for at least a month after the holidays. Also, most stores mark down merchandise significantly and only credit you the sales price unless you have the receipts to prove you paid more."